The Anthony Tools Tenon Tool Adapter is well-made product that enhances your ability to turn accurate and repeatable spindle tenons on the lathe. The manufacturer advertises .002” tolerances for final fit. It is designed to be attached to a 1/2” square nose scraper. The tool rides on the tool rest and also rubs against the bottom side of the tenon. 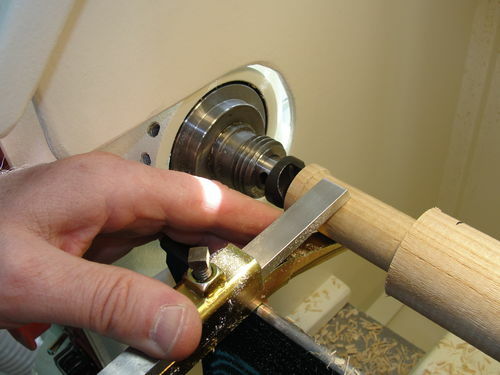 The scraper cuts at the top of the tenon and produces a clean, smooth cut. The scraper quits cutting when the edge reaches the tangent of the spindle. This cutting method is meant to remove only the final 1/16” of material. Prep work for the cut includes 1) removing wood to within 1/16” of the final desired tenon diameter and 2) setting the tool to acheive the desired final diameter/fit. I turn a small scrap of wood in a chuck to acheive the correct diameter. This allows easy removal of the test piece to fit into a pre-drilled hole. Move the tenon tool back on the scraper to turn a smaller tenon. This trial and error fitting process is slow at first, but I imagine a person would get quicker with experience. I plan to keep one tool set for 1” and another set for 3/8” for my typical chair builds. A quality scraper should hold an edge for quite a while since not much wood is removed on each cut. One wouldn’t have to go through the fitting process very often if you had multiple tools. The manufacturer recommends applying wax to the tool surface to prevent the protective coating from rubbing off. I found that the coating rubs off of the tool too easily even with a coating of wax. Wax and glue aren’t a good mix, so I will likely hone the coating off of the rubbing surface and deal with any potential rust later. 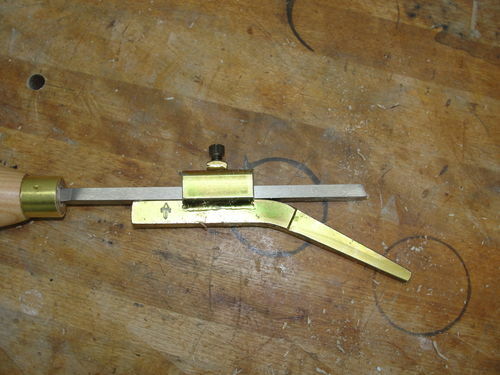 If you want to produce precisely fitted tenons, this is a tool worth considering. Set-up can be slow, but the final product is worth the effort. The cut is smooth, precise, and repeatable. Follow this link to a video of my initial use of the tenon tool adapter. (There might be a short delay before the video starts.) Follow this link to the manufacturer’s web site. Very clever! Thanks for the review. seems harder to do than just turning the tenon until an open end wrench slides over it..I’ve got enuf turning experience I can make a well sized tenon in a minute or so..this seems to take up way more time to set & use, since you have to turn it so closely then use the tool…maybe for a newbie…. Dusty..I got that experience by making hundreds of windsors & shaker rockers over the years. 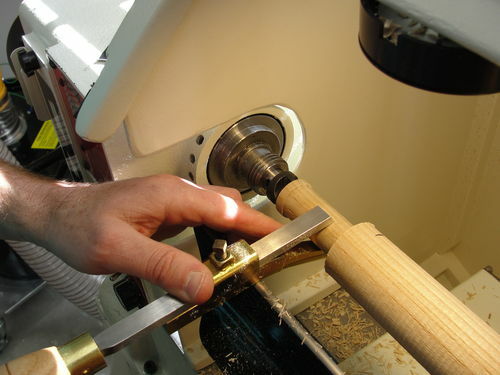 (many which were made on a homemade springpole lathe) . I do not doubt this will work, but if one can get within 1/16, why can’t one get to just perfect just as easily.? This device seems to have disappeared off the market. Does anyone know of a transmogrified reaappearance of the mfgr? I often times have to match the tenons in overbored or worn out holes in chair repair, and to me, this looks like it would do the trick well, with the help of caliper. Maybe shave a minute or two off each spindle end turning. maybe not, but who knows. I just want this task to go quicker and more accurate. Dusty…I ain’t workin from new, rather repairing old chairs, and oftentime the female wood has shrunk…What was 9/16 hole is now 35/64, run a 9/16 forstner into the hole to clean out the old glue and you got a sloppy joint when you try to reassemble/. Needed appropriate size drill to fabricate. Got it. Made it- Works like a charm….anyone wanna see. really it is so plebian and simple, but what the heck, if you aint seen one in action you just might wanna see it. Brother, I have no fear, as that feeling will eventually pass! Dusty Mark. Thank you so much for your nice review. If I could use your review link on my web site, I will send you a free tenon tool. Lyndal, you’re welcome. Go ahead and use the link. I’ve already got two of your sizing tools, so we’re good!